Most folks can smell a good doughnut from a mile away, and once that unmistakable scent hits your nose, it’s hard to resist. Florida has perfected the art of the doughnut, offering plenty of places to sate your sweet cravings. You’ll want to try every single one of these 10 best doughnut shops in Florida! If you never thought doughnuts and fried chicken don’t mix, you’ve been living a lie. Mojo Donuts has found a way to bring two of America’s favorite foods under one roof, and the result is nothing short of outstanding. They have a huge variety of doughnut flavors, ranging from classic glazed to Fruity Pebbles and cotton candy. They make a perfect dessert (or appetizer, if you want) to their delicious fried chicken. Don’t let the name fool you—this little doughnut shop offers some seating so you can enjoy your snack in store. In addition to their fabulous doughnuts (round and square), guests rave about their other meal options, including burritos, biscuits, New York-style bagels, and soups. There’s a reason why this little doughnut shop stays busy long after the breakfast rush is through—it’s the perfect pick-me-up for any time of day! Here you have your pick of classic favorites like chocolate glazed and doughnut holes, along with fun variations with Oreos and M&Ms. And if you’re looking for a good meal, you’ve come to the right place. Grab a burger, wings, salad, wrap, or other meal to enjoy with your doughnuts. This little family owned and operated doughnut bakery knows how to do doughnuts right. Open and thriving for over 33 years, guests know to get here early to make sure they can grab their favorite flavors. Each doughnut is made from scratch with lots of love and wholesome ingredients each day. The doughnuts here are so good the owners had to add additional locations to keep up with the demand. Aside from their amazing doughnuts, guests can enjoy fresh cinnamon rolls or a cronut (croissant + doughnut). These doughnuts are out of this world! 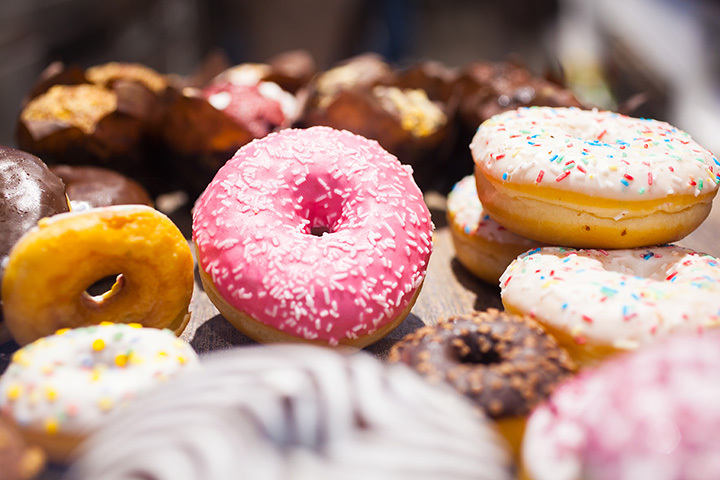 With over 40 flavors to choose from, you can find a doughnut to suit everyone in your group. If you can’t make it to the Jupiter location, you’re in luck—they have four other locations, with more slated to open soon! This doughnut shop has been around for decades, and for good reason—the staff is friendly, the selection is plentiful, and the taste is unbeatable. Guests swoon over delicious cinnamon rolls, apple fritters, and of course the variety of perfectly crafted doughnuts. Don’t let its humble digs fool you—the doughnuts within will having you coming back for more on a regular basis. Churning out some of the best doughnuts in Florida since 1962, locals and travelers alike agree there is no doughnut shop more worthy than this one. Fans have been known to travel from miles around just to get their hands on these irresistible confections. These are the doughnuts you longed for as a kid. Nestled right in Old Key West, fans can enjoy Red Buoy coffee while they devour old-fashioned doughnuts made right. If you want to get a little adventurous, try their candied bacon or hibiscus syrup for a one-of-a-kind experience. Touted as the best doughnut in town, this doughnut hut offers some of the friendliest service you’ll find in the state. Walk right in and feel like family, then settle in to some of your favorite doughnut flavors. If you’re pushed for time, grab a place in line at the drive thru to get your doughnuts faster!